Thank you everyone that responded to my article earlier this week on Hillary's non-viability as a 2016 candidate for convincing me just how right I am. Her politically clueless supporters buried me in emotional tantrums employing every logical fallacy imaginable, and her detractors were not far behind with equally devoid-of-reality doomsday predictions. But not one person, out of 100s reached, could make a logical counter-case that actually took the empirical barriers I mentioned into consideration. If you think Hillary stands a chance, it is because you don't understand civics; simple as that. Hence, this week I bring back the "you don't belong in the news" award just for her. 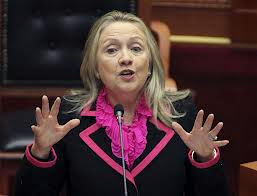 Hillary's political career is over; and she is abusing Americans' fundamental ignorance of our own political system to create hype and see if it goes somewhere. It won't; but the media's complicity in this is downright disgusting. The real news around us right now are the colossal policy failures of both the Bush Jr and Obama administrations - Iraq, the IRS scandal, the Bergdahl swap, etc. But reporting on these without both Parties sounding indistinguishably awful is difficult even for NBC or Fox News, which is especially dangerous during the Primary season. So it's "look, there's an odious retired politician on a book tour acting like a candidate!" Pathetic. This so-called media belongs in history's trash chute, WITH Hillary.